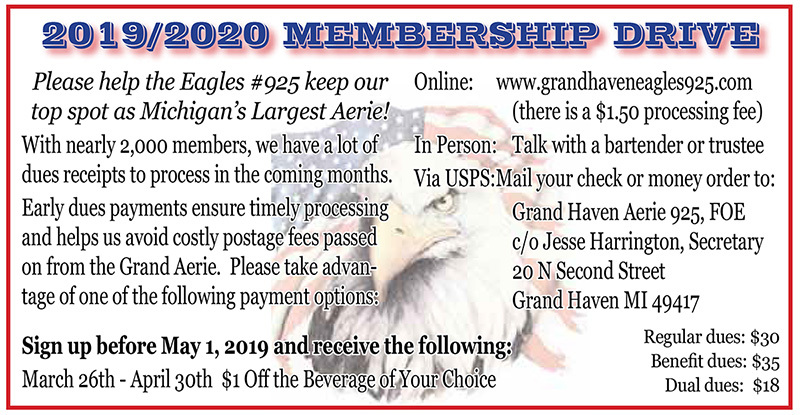 The Grand Haven Aerie 925, FOE has just over 2000 members. 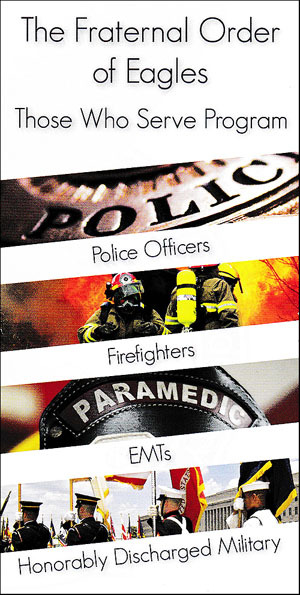 We have an active volunteer force and can always use more! We share great fellowship through a variety of events throughout the year offering entertainment, celebrating traditions, and supporting our local community. § The Grand Haven Aerie was instituted on December 14, 1904 as the 925th Aerie in the country. They held their first meetings at 100 Washington Avenue prior to moving to 212 Washington Avenue. After a fire destroyed the building in the 1930’s, they moved upstairs to what is now Buffalo Bob’s. In 1948-49 they constructed their present building at 20 N. 2nd Street. In 2005 an addition was constructed consisting of an elevator and storage areas. The elevator makes the building handicapped accessible. The Aerie’s membership has grown during the past few years and received an award for having the largest growth in the state in 2004-2005, 2008-2009 and 2012-2013 Many of its members reside throughout Michigan and neighboring states. The Aerie maintains a social room for its members providing weekly entertainment, pool and video games for members to enjoy. New members must be proposed by a present member. They received the “Peoples Choice” award from the Grand Haven Tribune for the best fish fry in the area for several years.. Several fund raising events are held each year including an outdoor entertainment tent during the first week in August. The Scottville Clown Band has performed at the Aerie for 58 years during this event. The Aerie also has an annual benefit chili cook off. Our Aerie supports many of its National Charities and local charities including the Salvation Army, Tri-Cities Crusade for Toys, Love Inc., Tri Cities Kids League, Pier Safety Task Force, Community Thanksgiving Feast, Muskegon and Holland Rescue Missions, Grand Haven Community Foundation Scholarship Funds and the United States Coast Guard Festival. The Aerie and Auxiliary has hosted 200 school safety patrollers annually for the past 59 years with a pizza party and magic show. They also present the “Reverence for Law” award to an outstanding law enforcement officer nominated by their superiors and a “Home Town Builder” award to an individual for outstanding service to their community during the past year. The success of the Aerie has depended on the volunteerism of its members for the past 109 years. The Aerie is governed by officers elected annually by the members. § The Grand Haven Aerie is supported by a Women’s Auxiliary instituted in 1948 and has many fund raising activities. The Grand Haven Eagles is supported greatly through those who volunteer and support our club’s fundraising efforts. The Grand Haven Eagles Volunteer Steering Committee is always looking for people who want to make a difference and we have many community and charity events throughout the year. Contact us about Volunteer Opportunities. Applications are available in the Social Room. Fill out the application, sign and date. You will need two Aerie members to “propose” you, and on any given day you will find members eager to do so at the Aerie. Submit the application with the application fee of $15 to the bartender. Your application will be approved at the Aerie meeting. Aerie meetings are held on the 1st and 3rd Monday of each month. The final step is to be initiated. Initiations take place at every meeting and you can be approved and initiated at the same meeting. Annual Aerie dues are collected in the amount of $30 at the time of initiation. Annual dues expire May 31st each year. For women there are two membership options: Aerie or Auxiliary. The Auxiliary operates a bit differently. Please contact Debbi DeYoung, the Auxiliary Secretary, with any questions. First Year of Membership Free! Facility Rental: The Aerie also has an upper level hall with a seating capacity for 350 people that is available for rent for wedding receptions, parties and other special events. The hall was recently re-decorated with new carpeting, dance floor, heating and air conditioning.